Watch TV shows, movies, and more any time you like. My On Demand: Access On Demand programming you've favorited, and active rentals. Movies: Instant access to the latest releases and Hollywood classics, all from the comfort of your living room. 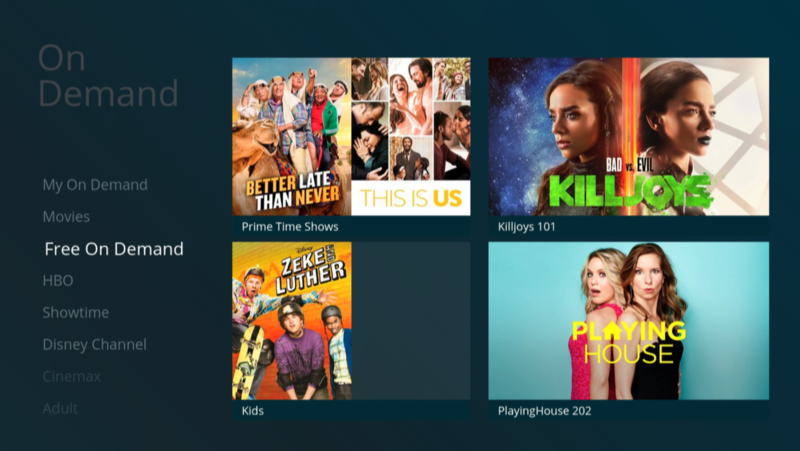 Free On Demand: Access to tons of free programs, like primetime shows from NBC, popular kids programs on Nickelodeon and more. Movie Channels: If you subscribe to HBO, SHOWTIME or Cinemax, you can access the movies, series or documentaries on those channels anytime. Premium Channels: Through a subscription, enjoy programming from Disney Family Movies, Karaoke Unlimited On Demand and more. Press on your remote to bring up the main menu and select On Demand or use voice commands and say "Go to On Demand." Choose a category and press SELECT. Pick a network or category and press SELECT. Select what you want to watch, highlight "Play" and press SELECT. Keep your account secure and avoid unexpected On Demand and Pay-Per-View charges with a personalized purchase PIN. Press on your remote to bring up on the main menu and select Settings. Highlight "TV" and press SELECT. Scroll to "Restrictions" and press SELECT. Highlight "Purchase PIN" and press SELECT. Follow the on-screen instructions to set up your 4-digit PIN.